It introduces the method of using this as ripe compost though the weed after it weeds is often seen to leave, and to be burnt as it is. Ripe compost is indispensable for organic farming. Is the grass that goes out to weed the troublesome one? There seems to be a reason in itself though there are a lot of people who burn the weed that goes out to weed in the vicinity in my country. In a word, it is the one that the weed becomes a fertilizer if the weed is left just as it is and the number of weeds increases further. Moreover, the number of weed seeds increases and the weed breeds. If the weed is burnt, the seed is burnt, too and it disappears, and it is the reason that the weed disappears, it doesn't become the fertilizer of the weed the weed doesn't grow easily for a while because of the burnt heat. It is not only a good thing that burns the grass. It might be bad. Smoke is generated by burning and it becomes a nuisance to the neighbors. There is a fire risk, too. Especially, many of causes of a forest fire are burnt of the grass and come. However, if the weed is used upon reflection as compost, ripe compost is obtained by free. The weed is thought to be a promising resource though time hangs a little. Moreover, sunlight comes to strike into ground well if the grass is removed after the grass is cut. Then, turfs breed, and the growth of other weeds worsens. When turf breeds, it becomes very easy to weed. The grass after it weeds is used as compost. There are a lot of slopes on the rice field and the road, and the weeding area is not odd in my country. The area of the slope might be wider than the area of the rice field according to the place. The amount of the grass after it weeds is not odd either. 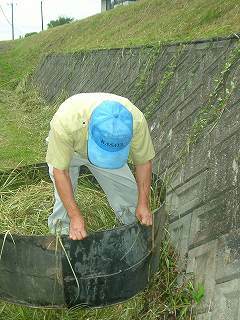 The grasses are collected with the rake as shown in this photograph, it makes to compost, and collecting is heavy labor. The transportation car of three wheels is convenient to transport the grass. A lot of grasses can be piled up, and the load can be put out by inclining the carrier like the dump truck. The collected grasses are put in the compost frame made from the galvanized iron of about 1.2m in diameter 45cm in height. When it is this size, a large amount of compost can be made. The compost frame made from this tinplate is what I have been using it since childhood. Because this compost frame is a thing that orders to relative's sheet metal shop, marketing is not done. It goes up on the grass and the grass is packed as shown in this photograph. At this time, it is possible to stuff by treading surroundings down naturally and well. When the grass is blocked to some degree, the compost frame is made as shown in the photograph and it improves it little by little. When autumn comes, compost can be made from the fallen leaf because a large amount of fallen leaves are obtained. I scatter directly on the rice field without doing the fallen leaf to compost and am cultivating it with the tractor. The grass rots early when not only the grass but also rice bran and the lime nitrolime, the foul dung, the cowcake, and water are mixed (Ferment), and compost can be made. Moreover, when the grass rots, the temperature can prevent the grass seed from germinating by 60 degrees or more (fermentation heat). When the fermentation of the grass ends, it is a completion of ripe compost. In general, there is little problem even if the one that doesn't grow up in the rice field puts a lot of weeds in the field and weeds in the slope in the rice field as it is. The weed that becomes a problem is only a spiderwort. This breeds very often also in the field and the rice field. The problem is not in the spiderwort if it makes it to ripe compost either. It covers on compost with the vinyl sheet when the grass is piled up and compost is made and it defends from rain. Moreover, heat insulation seems to be effective. Ripe compost and green manure are used as a fertilizer. 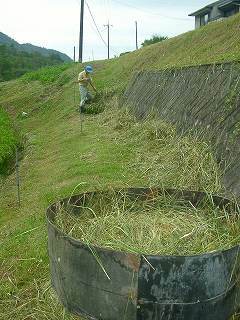 When rice field's being cultivate with the tractor in winter, the ripe compost made in summer is put in the rice field. It mixes it with the tractor with the soil at once afterwards. At this time, I scatter the rice field the fallen leaf that has been taken in the mountain together. The weed grows in rice field in spring. This crowds in the soil by the tractor. This is called green manure. I hardly use the commercial fertilizer.